The original purpose of cheesecloth was, as you may have guessed from the name, cheese making. It was used to separate liquids and solids in the cheesemaking process. Its flexibility and fine weave allowed for the liquid to be pressed from the solids, and it could then be washed and reused, making it a valuable resource. It was also used to wrap cheeses as they cured, to allow them to stay clean but still be able to breathe. If you’ve never had cause to use cheesecloth you may be asking yourself, “What exactly is it?” That’s simple. It’s a loosely woven cotton cloth that’s very lightweight and versatile. It comes in different grades with varying tightness of weave. You can often find it at grocery stores, craft stores, or specialty stores. I’ve even found it at the feed store plenty of times. There are far more uses for cheese cloth that we’ve all but forgotten in this world of throw-away everything, though. Here are several different ways you can use this versatile fabric. Obviously you can still use cheesecloth for cheesemaking. This may seem like a huge stretch, that you could make cheese in your own home, but there are several types of cheese that are truly not all that difficult to make yourself without special equipment or hard to find ingredients. You can check out some great easy cheeses here. Whether you’re marking off a construction site, flagging a long item hanging over the end of your pickup bed, or trying to gain attention in a survival situation, cheesecloth makes a great signal flag. 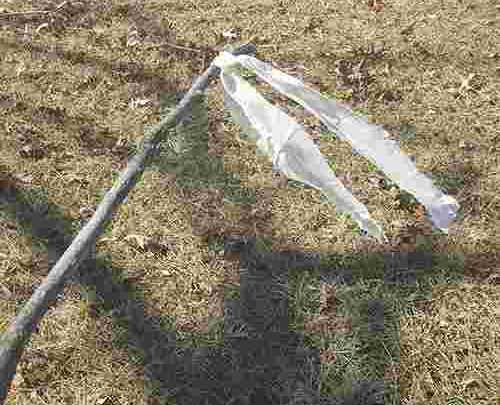 Its white color and its ability to blow easily in the wind make it perfect for the job. While I certainly don’t recommend cheesecloth for more serious dusty jobs, like drywall work, it’ll do the trick if you’re in a pinch – say, if you got caught outside on a windy day in a dry area. Fold it over until dust in the air mostly stays out but you can still breathe easily through it for the best results. Ever had a picnic where you just can’t keep the bugs off your meal? Or maybe you can’t keep the bees out of your sugary drink. Just toss some cheesecloth over the table and the bugs can’t get to your goodies. It can be used for covering foods that are air drying for preservation, as well, like jerky or seeds. 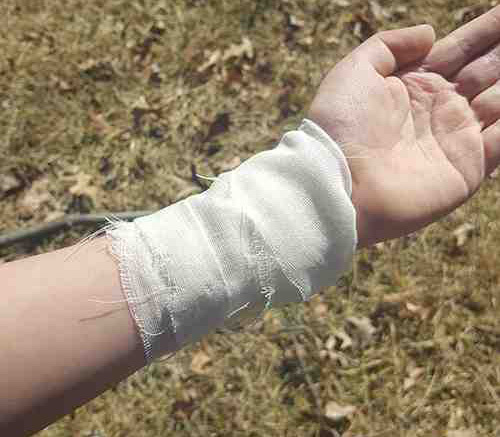 Cheesecloth makes a great breathable bandage to help keep wounds covered and clean. 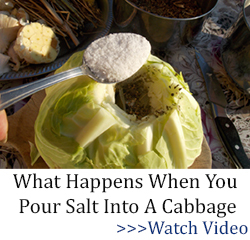 It can also be boiled to help kill any germs it may be harboring, making it reusable if you don’t have unlimited access to more modern sterile bandages. You can use cheesecloth like a window screen to keep bugs and debris out of your living space, or as a gauzy window dressing. Used as sheer curtains, it can provide a lovely primitive vibe to any space. 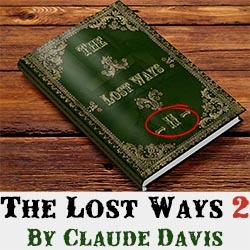 You may have seen this before in old books and not even realized what it really was. Cheesecloth, dipped in a mixture of flour and water, is applied to reinforce broken or weakening book spines or other defects in the paper. Whether you’re looking for a bait net or a net for scooping up your catch, cheesecloth can do it. Water can run freely through it, allowing fish to stay alive but still trapped. Because it’s so versatile, it’s a perfect survival fishing net option. There are countless crafty uses for cheesecloth. You can create spooky Halloween ghosts, countless scary mummy crafts, wintry snowmen, or perfectly primitive tea-dyed placemats or napkins with it. During the 1960s and 70s cheesecloth was a popular material for making trendy clothes. Tops, skirts, pants, and even shoes were made from this humble fabric. Its gauzy nature and natural fiber makes it a fashion-forward and comfy material. It also takes dye easily, since it’s made from cotton. So long as you use a very fine grade of cheesecloth with very small holes, you can use it as a water filter. Simply lay cheesecloth over the top of the container you wish to catch water in, hold it in place with whatever is handy (even your hand will do, usually), then pour the water through it to remove large particles. Keep in mind that this method does not create water that is safe to drink if it wasn’t before this. 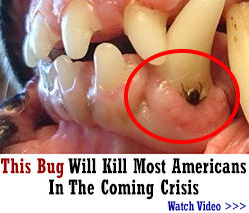 It certainly needs to be boiled if there’s any risk of bacteria being in it. We know that mosquito netting can literally save lives when used properly by preventing mosquito born illness and infection, and cheesecloth can be used as a makeshift mosquito net. Depending on how much you have, you can use it to cover your face and neck, apply it kind of like a shroud, or create a bed covering from it. And this is a mosquito trap that really works. With either natural materials like moss and mud, or camo-colored spray paints, you can turn regular cheesecloth into a lightweight, see-through camo fabric for covering duck or deer blinds. You can also use this colored cheese cloth to add dimension to a ghillie suit, or sew it up into a breathable camo face mask. Make up a cheesecloth bag full of small gravel or sand to create an abrasive material that you can use for heavy duty cleaning projects, removing rust from surfaces, or shining up any metal surface. Add a little wood ash and water to a cheese cloth bag for another variety of cheese cloth cleaner. Infuse whole spices to soup or cider by putting them in a cheesecloth bag and adding the whole thing to the mix. You can also make up bags of tea, herbs, flowers, and other plant matter to create your own delicious tea, free from the grit that comes from loose leaf tea. It’s perfect for homemade medicinal teas. 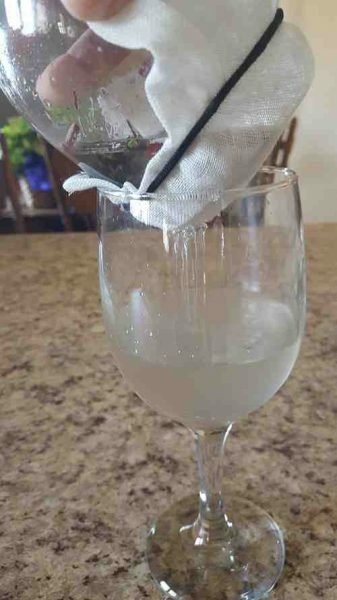 When you need to get the flavor of a fruit but none of the fibrous material, you can place it in a bag made of cheesecloth to keep the skins and other fruit solids out of your jellies or syrups without sacrificing any of the flavor. Here’s how to make survival dandelion jelly with 2 years shelf life. Pretty muslin swaddles are all the rage in the baby world, but they can be expensive! 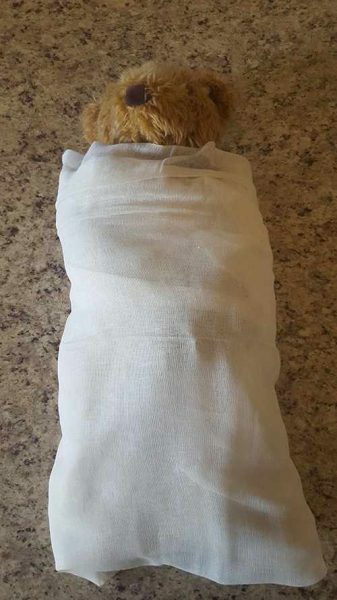 You can make your own for significantly less with some fine grade cheesecloth, a baby-safe dye (if you wish), and either a needle and thread or a sewing machine to finish the edges. 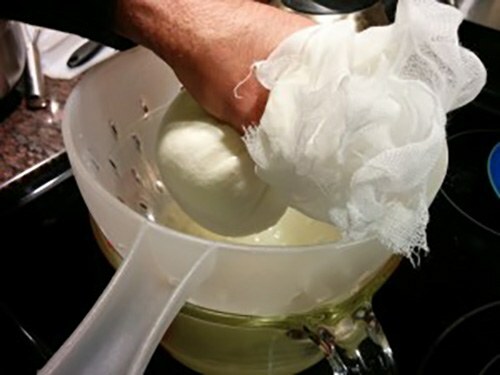 Cheesecloth is the answer to lots of problems, in and out of the kitchen. Because it’s so versatile, it’s a great item to keep around just in case. It’s packable and lightweight, making it a great addition to your survival gear. What is difference between cheese cloth, gauze, and muslin? The most significant difference is most important in the commercial uses of the different products. For the average consumer there is insignificant difference. If you are interested in the technical differences between the three fabrics I would suggest that you look up those terms on Wikipedia. 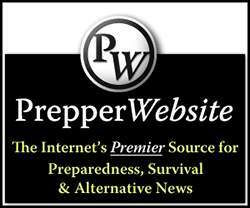 The differences are interesting but of no practical significance to the prepper. It might be of passing interest to note that one can also have wire gauze that is used in scientific applications. Gauze is made of cotton and is useful in the medical field where a wound must be kept covered but needs to also have air. 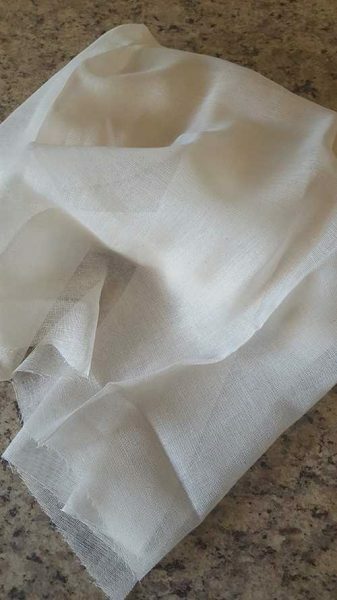 Muslin and cheesecloth may be made of different fabrics, although traditionally cheesecloth was made only of cotton also. Cheesecloth comes in different weights depending upon the size of the thread used to make it. Craig, I believe it has to do with the tightness of the weave. All three are generally made of cotton, just woven more tightly with cheesecloth being the loosest and muslin being the tightest of this list. You could compare it to the difference between 180 thread count sheets and 800 thread count sheets. There are threads per square inch with the higher thread counts. Thread count is a good analogy. Experience with the various uses of each cloth matters. So, practice, practice, practice. Thanks. Cheesecloth is available in at least seven different grades, from open to extra-fine weave. Grades are distinguished by the number of threads per inch in each direction. Obviously, fewer threads per inch allow for larger particles to pass through. Gauze is a thin, translucent fabric with a loose open weave. In technical terms “gauze” is a weave structure in which the weft yarns are arranged in pairs and are crossed before and after each warp yarn keeping the weft firmly in place. This weave structure is used to add stability to fabric, which is important when using fine yarns loosely spaced. However, this weave structure can be used with any weight of yarn, and can be seen in some rustic textiles made from coarse hand-spun plant fiber yarns. Gauze was traditionally woven in Palestine and the English word is said to derive from the place name for Gaza (Arabic: غزة‎ ghazza), a center of weaving in the region. Despite a prohibition on trade with non-Christians from religious authorities in medieval Europe, a fine type of silk known as gazzatum was imported from Gaza as early as the 13th century. Though members of religious orders in Europe were forbidden to wear it, the fabric won a place for itself and emerged into modern life as gauze. According to the French government’s online etymology dictionary, the English form of the word derived from the French gaze, whose ultimate origin is uncertain, but is often attributed to the Arabic and Persian word qazz meaning “raw silk”, which itself was obtained from the name of Gaza. The same source says the existence of “an ancient textile industry in Gaza is not assured,” and it is not known how the word entered into widespread use in European languages, with examples of first usages cited being the medieval Latin forms garza in Bologna in 1250 and gazzatum in Budapest in 1279. Gauze was originally made of silk and was used for clothing. It is now used for many different things, including gauze sponges for medical purposes. When used as a medical dressing, gauze is generally made of cotton. It is especially useful for dressing wounds where other fabrics might stick to the burn or laceration. Many modern medical gauzes are covered with a plastic porous film such as Telfa or a polyblend which prevents direct contact and further minimizes wound adhesion. Also, it can be impregnated with a thick, creamy mixture of zinc oxide and calamine to promote healing, as in Unna’s boot. In film and theatre, gauze is often fashioned into a scrim. Gauze used in bookbinding is called mull, and is used in case binding to adhere the text block to the book cover. Modern gauze is also made of synthetic fibers, especially when used in clothing. 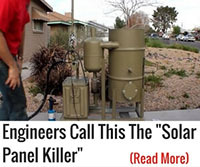 It can also be made of metal, such as a wire gauze placed on top of a Bunsen burner, used in a safety lamp or spark arrestor, or used as a fence. Unfortunately, the weave pattern for gauze won’t reproduce on this website. Muslin also mousseline, is a cotton fabric of plain weave. It is made in a wide range of weights from delicate sheers to coarse sheeting. They were imported into Europe from India in the 17th century and were later manufactured in Scotland and England. It gets its name from the city of Mosul, Iraq, where it may have been first manufactured Early muslin was handwoven of uncommonly delicate handspun yarn, especially in the region around Dhaka, Bangladesh where it may have originated. It was imported into Europe for much of the 17th and early 18th centuries. Fine linen muslin was formerly known as sindon. 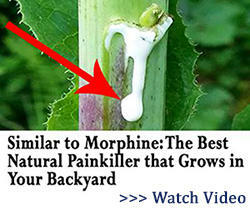 I might add to all of the above, not all medical sponges are made of gauze any longer. Some of them are made from some type of poly fiber. I believe the use of the poly fiber may be that it doesn’t stick to a wound as much as gauze sticks to a wound although I haven’t done much research to support that belief. It also is probably cheaper to use artificial fiber than to use natural fiber, although again, no research to support that opinion. Now we all know way more about gauze, muslin and cheesecloth than we probably ever wanted to know unless we worked in a fabric shop. Except for cheese making, we can probably substitute gauze and muslin for many of the purposes listed in the main article. With all this information coming out, did we forget about women’s sheer stockings like WW2 rayon, nylon, or silk stockings? Great comment string. Hi, Craig. I’ve even heard of some people using nylon stockings as clothes dryer vent filter if the hose didn’t vent to the outside. Sounds very practical to me and in the winter could supplement the heating system for a short time. Also add some much needed humidity to the air in the winter. In the summer you hang your clothes outside. Window coverings is not one I would ever have thought of. Sounds pretty darn cool to me. LOL! We have used gauze curtains for privacy for over 50 years. 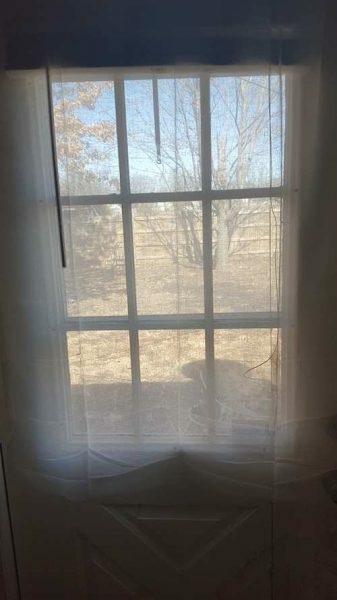 If you want to open the drapes or the blinds for more light but maintain privacy, rather than spend the money for expensive plastic film on the window, just buy a set of cheap gauze curtains that go on an old-fashioned curtain rod to provide privacy on your windows. You can see out but passers-by can’t see in — that is unless you have interior lighting. Doesn’t work at night you have to close the drapes or the blinds. 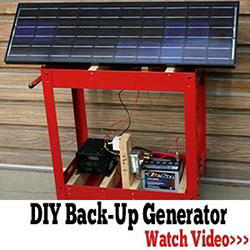 You can buy them at Wally World or Amazon and I am sure at least a half a dozen other on-line vendors. I make jelly from fruits and even from prickly pear. Cheese cloth is great for separating the solids and skins from the juice and even squeezing out the last bit of juice by twisting it. 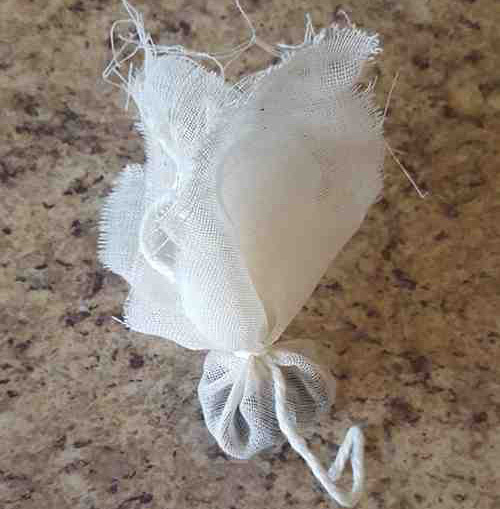 I make herbal sun teas and tie a bit of cheese cloth over the jar opening to strain out the leaves as it is poured into glasses. Grandma made her cheeses with it. I strain homemade yogurt to make a more firm cheese to make my dips or flavored spreads with. Makes great cheesecake also. Must have cheesecloth to do it right. The whey is used in my bread making for any liquid needed. I feed my sourdough starter with it also. I almost forgot that Dad used cheesecloth too. He strained shelac with it. 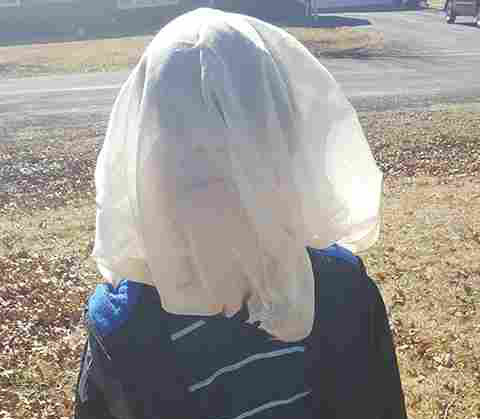 He also made a sweatband from cheesecloth tied around his head and on hot days moistened cheese cloth tied loosely around his neck for cooling. 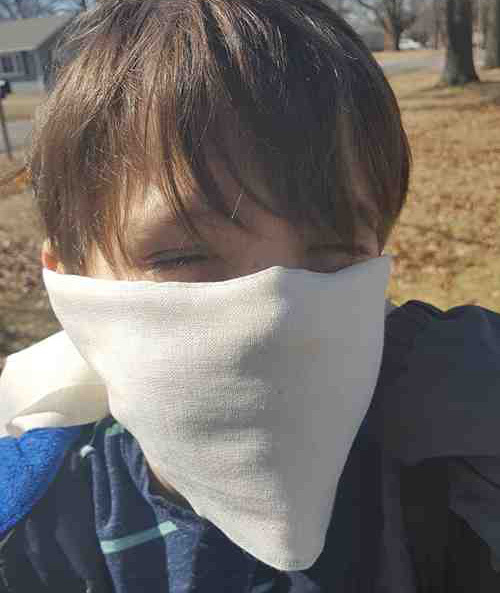 Folks today use bandanas but we had cheese cloth and it was cheap so it was what got used.